Clear color. Aromas of wild lemon, mineral water, and underripe cherry with a round, vibrant, dry light body and an effortless, medium-length black pepper and creamy potato finish. A skillfully crafted vodka with extraordinary smoothness and excellent mouthfeel; martini-worthy. Bottom Line: A skillfully crafted vodka with extraordinary smoothness and excellent mouthfeel; martini-worthy. 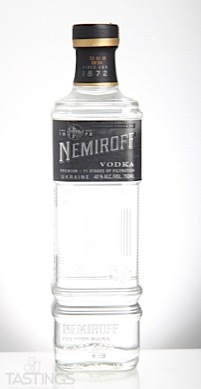 96 • Nemiroff Vodka 40% (Ukraine) $17.99. 93 • Nemiroff Honey Pepper Vodka 40% (Ukraine) $17.99. 95 • Nemiroff LEX Vodka 40% (Ukraine) $20.00. 93 • Nemiroff Premium De Luxe Vodka 40% (Ukraine) $14.00. Unflavored vodka is defined in the US as a "neutral" spirit devoid of color, aroma, and taste, however, the finest unflavored vodkas are served neat and do have a subtle taste, sometimes of the base grain or ingredient, citrus or even anise. But most vodkas are used for cocktails, often mixed with fruit juice (cranberry juice for Cosmopolitans or orange juice for Screwdrivers. ), tonic, or soda for the ubiquitous bar-hopper favorite Vodka & Soda. To which craft bartenders these days like to say, "vodka pays the bills." Unflavored vodka is made by fermenting and then distilling the simple sugars from a mash of pale grain or vegetal matter. Vodka is produced from grain, potatoes, molasses, beets, and a variety of other plants. Rye and wheat are the classic grains for Vodka, with most of the best Russian Vodkas being made from wheat while in Poland they are mostly made from a rye mash. Swedish and Baltic distillers are partial to wheat mashes. Potatoes are looked down on by Russian distillers, but are held in high esteem by some of their Polish counterparts. 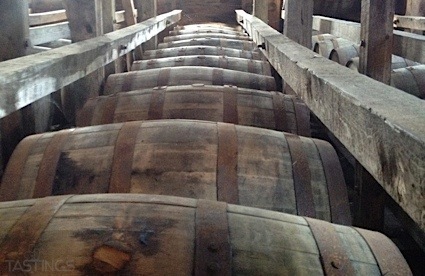 Molasses, a sticky, sweet residue from sugar production, is widely used for inexpensive, mass-produced brands of Vodka. American distillers use the full range of base ingredients, but most are made from the abundant supply of corn from the US heartland. Nemiroff Vodka rating was calculated by tastings.com to be 96 points out of 100 on 3/20/2018. Please note that MSRP may have changed since the date of our review.